The mighty Tyrannosaurus Rex might have had tiny arms, but it's massive head and teeth more than made up for the loss of reach when gobbling up prey. 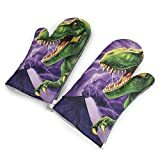 While these dinosaurs may now be extinct, you can still get a feel for what it would have been like to be one when you slip on this cool new T-Rex Oven Mitt. 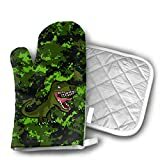 This ferocious silicone oven mitt is shaped like a T-Rex head with an outside texture that simulates skin and a mouth filled with ridge-like teeth for grip when hunting hot pans of cookies in the oven. 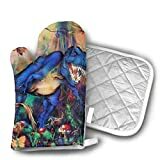 A great way to turn a ho-hum day of baking into a much more roaringly fun experience.